Attracting visitors to your church is the first step in achieving church growth. Understanding the visitor experience can provide valuable information that can be used to create a first time experience that makes the visitor want to come back – and hopefully join the church. When I visit a church there are several things I pay attention to. I like going someplace that is welcoming, comfortable and consistent with my belief system. I am interested to see how well church leadership communicates and how well volunteers perform their duties. Churches want to know when a visitor attends so they can welcome them and help them transition into members. The challenge for churches is knowing who the visitors are – and reaching out to acknowledge them. It can be easy to slip in undetected in a church of more than a few hundred people, so creating systems that identify visitors and understanding their experience can be very enlightening. 1. How did you hear about the church? Its important to know how someone hears about your church. Word-of-mouth is the best avenue to get people to visit but having a strong internet presence can also be helpful. For example, when I moved to a new city I Googled churches in my area and that is how I found the church that I now call home. Whether other members are doing a good job inviting people or the SEO team is doing a good job getting search traffic to your website, you want to know about it. 2. Was this your first time visiting? When someone visits for the first time, they are going through an assessment of the entire visitor experience. Knowing this information can give you the opportunity to reach out and be available to answer any questions or merely offer a friendly contact. My pastor does a great job with this in that he reaches out and offers to buy a visitor a cup of coffee and makes himself available to share his vision and answer any questions someone might have. 3. Which service did you attend (if multiple services)? If your church offers multiple services, it can be helpful to know if one attracts the most visitors. This kind of information can be useful as you plan and prepare for weekend services or special events. 4. What is your name, address, phone, email? Capturing visitor contact information can allow you to share church event information with them. Be sure to have a box that they check to give you permission to contact them. Whether it is phone, email or regular mail, privacy laws have made people sensitive to receiving unsolicited contacts. Be aware of this so you don’t inadvertently send the wrong message to your visitors. People with children very often are looking for a church that has good kids programs. Knowing how many children there are in a family, and their ages, can be useful information to have when sharing information about church sponsored events that target kids. 6. Do you have a prayer request? People often visit churches when they are either new to a city or going through a life transition. Allowing visitors to share prayer requests communicates that the church truly cares about its visitors and is willing to partner with them on prayer needs. 7. Would you like more information about our church? 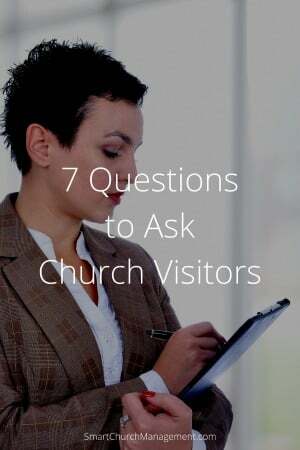 Ask if the visitor would like more information about the church. This allows you the opportunity to share information about church programs and events that might be of interest to them. The visitor survey could look something like this. You can access an editable copy of this document by clicking here. Use your leadership team to help determine the best place to put this survey. I’ve seen it as a tear-off in the bulletin, printed cards in pockets behind the seats or handed out by the ushers. Try to determine the best spot for these and communicate where to place them once they are completed. You can also go digital by embracing the mobile revolution and creating a digital connection card on your church mobile app. This new concept not only saves time but it save money by eliminating the paper! Church growth happens when a church does a great job and new people join because they recognize the quality of the church experience. This is the result of creating an environment that is welcoming, comfortable and easy to transition into. How do you gain insights into the visitor experience at your church? I have done a 3 hour workshop for over 36 years on Winning First Time Visitors in hundreds of churches around the world. Very few people pick a church because of the Pastor. It starts in the parking lot. On their first appearance, most visitors wish to remain anonymous. They may give as little as an email address, and almost never a phone number or mailing address.